The fifth course in the Foundational curriculum provides care managers with skills for developing more comprehensive and person-centered care plans. Purposeful and well-developed care planning requires care managers to have proficient aptitude focused on distinct client needs. The course focuses on providing care managers with the skills for coordination of medical and behavioral treatment, coordination of medical and long-term services and support, and confirmation and reconciliation of medication. In addition, the course includes modules for building person-centered acumen related to provision of resources in the form of community support and advocacy, facilitating patient activation and engagement, and establishing care planning goals and discharge criteria. Each module within the course can be taken separately. Care Planning course has been pre-approved by the Commission for Case Manager Certification (CCMC) to provide 16.5 hours continuing education credit to Certified Case Managers (CCMs). All of the case management training offered through Care Excellence has been designed to give you exactly what you need, when you need it. Feel free to take the entire Care Planning course for a broader understanding or laser focus your training on any combination of the modules below to address specific challenges. Please call us if you want to purchase multiple modules or if you need assistance designing a custom combination of solutions. Proficient care planning is a skill that should not be underestimated, especially in the current environment of complex health care needs. In this module, care managers learn the core elements of care planning, which will enable care managers to become grounded in the true purpose and goals of this important work. This module also provides care managers with tools, techniques, and strategies for developing purposeful and robust person-centered care plans that address the multitude of complex issues within the client’s environment. An ongoing challenge care managers face is working with clients who experience both medical and behavioral difficulties in care. In this module, care managers learn the ins and outs of working with complex medical and behavioral clients including tools for soliciting information, techniques for effectively building rapport, and strategies for care planning. Additionally, this module teaches care managers skills for client advocacy and improved working relationship with health care providers, community resources, and support systems for clients faced with medical and behavioral challenges. Care managers provide services within an intricate system of Medicare and Medicaid based programs. One of these programs is Long Term Care Services. In this module, care manages learn how to navigate the intricacies and nuances of the various programs and settings within Long Term Care Services and Support. This module provides an understanding about the different programs and qualifying factors, information on accessing specific benefits authorized in the Social Security Act, and methods for identifying and referring clients to Long Term Services and Support programs. Clients in care management often have complex medication regimens as a result of chronic medical conditions. A challenge for care managers is confirming and reconciling medications. In this module, care managers learn how to confirm and reconcile medications effectively, what to assess for relative to client medication regimen needs, tools for improving medication adherence, and strategies for working with multiple prescribing providers. Clients in care management have distinctive needs that require specific community and advocacy resources in order to reach goals. In this module, care managers learn about the importance of resource identification and development from an individual perspective, a community perspective, and an industry perspective. The module also teaches care managers how to effectively evaluate community and advocacy support systems, how to work with existing programs to meet the specific needs of individual clients, and how to advocate for development of additional programs within communities. Care plans must be person-centered and meet the needs of the individual client; however, they can only be person-centered if the client is activated and engaged in the process. In this module, care managers gain a comprehensive understanding of the benefits of activation and engagement and the barriers of activation and engagement. 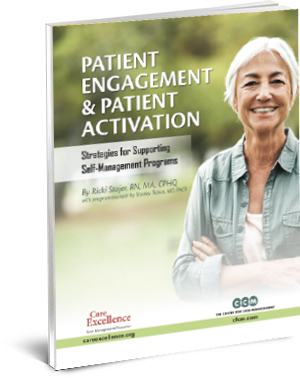 More importantly, this module provides care managers with tools and strategies for facilitating activation and engagement. Care management is not a life-long program, but rather a program designed to provide support to clients during complex and challenging periods. This module teaches care managers about the importance of establishing goal and discharge criteria in care plans. It also provides care managers with skills for identifying client milestone achievement, tools for helping clients recognize and accept self-readiness, and supportive methods for graduating clients out of care management into self-advocacy and self-direction of care.